We all know that digging can be a back breaking chore. Constant bending to pick up soil and turn it gives you backache, so we have found a new version of the Wolf Terrex Autospade to help. This ingenious tool (popular in the 1970s and now back in production!) has been specially designed to reduce back strain and effort with the bonus of digging at up to twice the speed of a conventional spade. All you have to do is take a spit, pull back on the comfy handles and a large spring at the base of the shaft acts to throw the soil forward and turn it over. 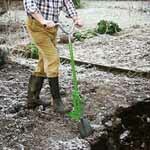 It features a carbon steel blade which holds a lovely sharp edge, galvanised fixings and comfy grip PVC handles. Overall length approximately 120cm (47), fully extended 128cm (50). Our community of gardeners have a wealth of experience, beautiful garden and great photos, discover more on the following pages: hand tools.